We have dived into the sea of fun, active and authentic experiences, and have brought up the ones we think will provide you with the best memories. Browse the gallery below and experience only the best Piran has to offer. Would you like to know what "gavero", and "taperini" are? How much salt does a saltpan worker harvest a day? We can answer your questions in front of the saltpan museum on a salt field and show you that work in the saltpans is not that easy. At the entrance to the park, you can rent bikes for free (also available are child bikes and child bike seats), take a ride to the saltpan museum - where you can meet a saltpan worker, try salt harvesting in the salt field, have a guided tour of the museum and go back to the entrance by bike. Every visitor takes home a bag of self-harvested salt. All sea and seafood lovers are offered an interesting and unforgettable experience, guided tours of the Fonda fish and shellfish farm. We will find out why Piran sea bass Fonda is so particular and tasty. We will sail on the sea to its home. During our trip, you will discover many fish and shellfish farming secrets. You will get to know the selection of juvenile fish, fish food and feeding fish, the duration of seabass growth, how mussels live and how to recognize a really fresh fish. We will finish the trip tasting some Fonda specialties. Romance in Piran "Lassa pur dir"
Welcome to the most romantic house in the most romantic place on the Slovene coast. The Venetian House is the right choice for all guests who are interested in the rich Venetian merchant, his love for a simple girl from Piran and the adage "Lasa pur dir". Make a toast to eternal love with excellent sparkling wine on a beautiful terrace with a view of Tartini Square, and enjoy the sound of the famous Tartini violin. Make sweet dreams in a marvellous suite in total comfort. Come to Piran's hinterland, to the family farm Gramona. Try our freshly produced specialties in the olive grove and enjoy the view of the Sečovlje saltpans, discover the secrets of tasting organically produced olive oil (which has received many prizes!) and enjoy the view of the Sečovlje saltpans. An excellent experience for all foodies. Are truffles really an aphrodisiac? Why have hunting dogs replaced hunting pigs? Are truffles really only meant to be picked in the morning? A truffle man and his dog will show us the secret world of truffles. The path will lead us into the forest, to a secret point where, with a little bit of luck, we can find among the tree roots the smelly tuber. After the truffle hunt, we will enjoy fuži (home-made pasta) with truffles and a glass of local wine. 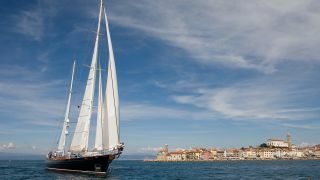 Experience the best Piran has to offer!